That is a very nice picture! And the Fox Fur and Christmas Tree pariedolia objects in the pareidolia constellation of the Unicorn are standouts in one of my favorite regions of the sky. Particularly because so much of this cosmic eye candy owes its presence to one of the bluest stars in the sky, S (or 15) Monocerotis. S Monocerotis is so blue because it is intrinsically very hot, at spectral class O7V, but also because the star is relatively unreddened from our point of view, unlike most O-type stars in the sky. When I checked the Hipparcos parallax of S Monocerotis, I thought that the star was disappointingly faint. Part of the reason for its relative faintness is undoubtedly the sheer youth of the star, because stars get brighter as they age. But it wouldn't surprise me if S Mon really is kind of faint for its spectral class, because I have come to believe that the spectral class and the luminosity of stars aren't always that strongly tied together. The youth of S Monocerotis can be inferred from the fact that the star hasn't had time to blow away all the dust in its vicinity, even though it has cleared a cavity for itself. The Fox Fur Nebula owes its tattered appearance to the strong winds of S Mon, and the Fox Fur is doomed. Note that you can see blue background light peek through tears in the Fox Fur. There is also a dusty blue reflection nebula to the right of the Fox Fur in this APOD. There are no such things to be seen in nebulas surrounding older O-type stars. Note, too, that there is a structure far to the left in the picture that is somewhat similar to the well-known Cone Nebula far to the right in this picture. Both are windblown "pillars" sculpted by the winds of S Mon. Obviously I like today's APOD because it is an RGB image that brings out the lovely blue, pink och yellow color of this spectacular skyscape! I think it took more than 10 years for me to see the Christmas Tree, you have to turn the image south up. "Princess Unicorn" and "Moroccan Christmas Tree"
<<"Princess Unicorn" is a toy for young girls that became wildly popular at Christmas time. Dwight Schrute bought out the market for the toy and sold them for a huge profit margin in the episode "Moroccan Christmas." Princess Unicorn is a human princess similar to a Barbie doll, but with a horn coming out of her head. She comes with a magic wand adorned with crystals, a pink necklace, and a gold belt. "Princess Unicorn is from a distant land on a distant planet far away in the future. She came from her father, king of unicorns, and her mother, queen of the princesses. Sorcerissa, the evil witch, cast a spell on Princess Unicorn's parents, forcing them into another dimension and doused Princess Unicorn with radiation. The radiation did not hurt Princess Unicorn, but gave her magical powers. She can summon her magic by holding her wand and calling out, my horn can pierce the sky! Now she uses her magic and beauty to write for the school paper, defend the kingdom, and battle Sorcerissa, so she can be united with her mother and father someday." I love the Cone Nebula! It is a tradition on earth to adorn the top of a Christmas tree with a star. But if the Christmas tree itself is made of stars, what should you use? Evidently a pine cone! A higher-resolution close-up of the Cone Nebula is in a previous APOD. A beautiful image from Hubble was given on March 15, 2017 at: https://apod.nasa.gov/apod/ap170315.html . Evidently, a star just outside the cone (just to its left in today's APOD) called NGC2264 IRS, is forming the cone. Although the star's radiation is eroding away the material, it also was involved in putting enough pressure on that material that it may have been the trigger for the formation of other stars that got going before too much material was eroded. I think the cone shape itself is a result of this kind of tug-of-war. While the radiation pressure from NGC2264 IRS can push material to the right, in the regions within the cloud where a large enough star or proto-star has formed, the gravity of that star will overcome the stripping and hold on to the material. Hence one sees stars forming at the ends of such structures. As the next star(s) mature(s), the process may repeat itself in some cases. 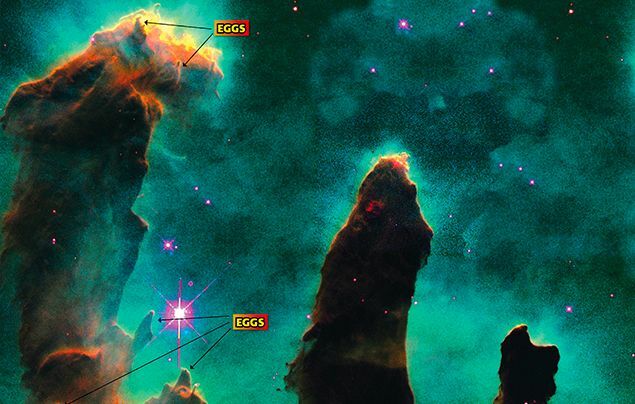 Stars hatching in the Pillars of Creation. I'd say it's not uncommon for stars to form at the tip of structures like the Cone Nebula. 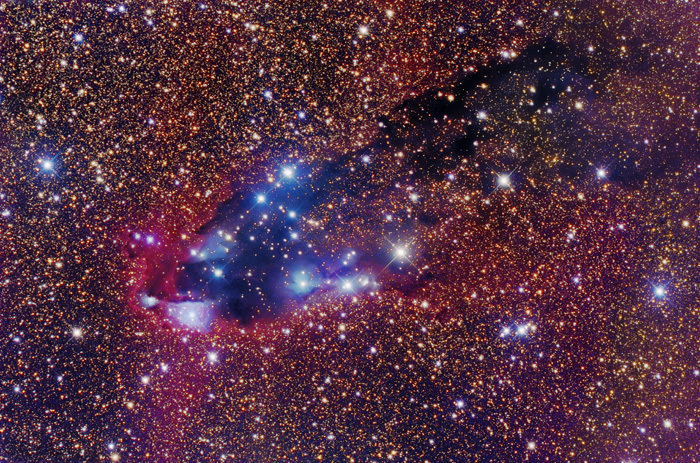 The Dark Tower in Scorpius, blowing its own star-bubble. A star forming at the top of the Horsehead Nebula. All these "pillars" or "cones" have formed near energetic stars, which are blasting them with their fierce radiation and stellar winds. The cone-like structures form because the gas is denser inside them, so that these structures can "remain standing" when the surrounding gas and dust is being cleared away. The gas near the top of pillar-like structures is being compressed, enabling (low-mass) star formation there. P.S. I found a nice picture which "puts the Dark Tower in Scorpius in perspective". The picture is way too big for me to post it here as a picture (3 MB), but I'm posting it as a link. Open it at your own risk! The picture is here. 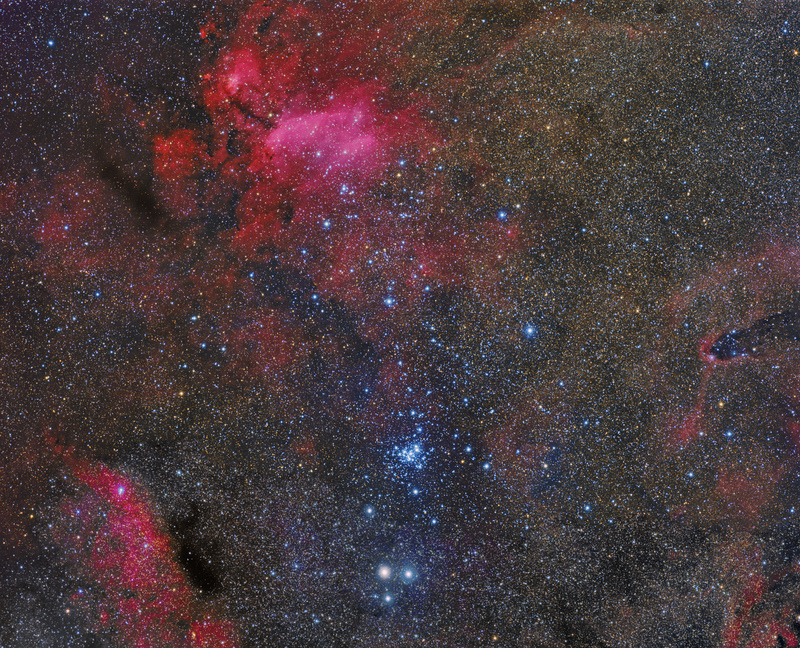 Below center you can see massive cluster NGC 6231, full of O- and early B-type stars. At top left you can see a large red emission nebula called the Prawn Nebula or IC 4628. It seems certain that NGC 6231 has helped create this nebula and star forming region by compressing gases there. At bottom left there is a dark nebula and an emission nebula, and at right you can see the pillar-like globule, the Dark Tower. Note how it is pointing straight at NGC 6231. I won't wax poetic ... because I'm not. But this is one of the most beautiful things I have ever imagined being able to see. I'm imagining it in a time-lapse that shows first a brooding, lifeless, dark, cold cloud, and then the glistening stars appearing as it is cleared away.